Hours before strutting down Broad Street in the city’s New Year’s Day parade, hundreds of Mummers and their families gathered for a liturgy that’s been a beloved tradition for decades. 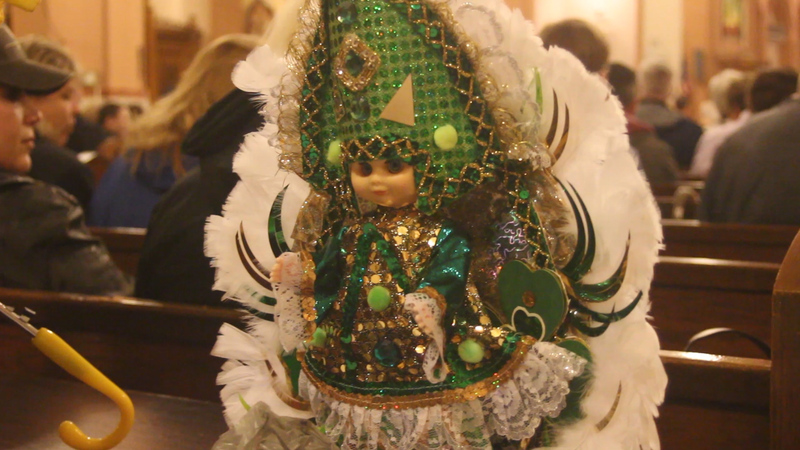 Now in its 30th year, the annual Mummers Mass was celebrated on Dec. 31 at Our Lady of Mount Carmel Parish in South Philadelphia. Mummers from at least a dozen clubs served at the liturgy, which marked the vigil of the Solemnity of Mary, the Mother of God. “It’s one of the most crowded Masses we have all year long,” said parishioner Mark Squilla, a Philadelphia city councilman and member of the Shooting Stars Fancy Brigade. According to the Mummers Museum, some 10,000 participants don costumes and string band instruments for the Philadelphia parade, which ranks as the nation’s oldest of its kind. The event draws hundreds of thousands of spectators in person and via television. The city began formally sponsoring the parade in 1901, but the Mummers’ roots extend back to ancient and medieval traditions. Locally, the practice of dressing in costume and acting out short skits during the holidays grew with the influx of European immigrants into Philadelphia. Such performances have historically relied on humor and satire: the word “mummer” itself derives from medieval French and English words for “mask” and “mutter,” and may also be related to the name of the Greek god of ridicule, Momus. The five divisions of Philadelphia Mummer clubs – comic, fancy, wench brigade, string band and fancy brigade – were highlighted at the Dec. 31 Mass, which was preceded by a presentation of iconic items from each group. After a prelude by the Mummers Chorus, a stylized umbrella, a set of golden slippers, a Mummers doll, a banjo, and two trophies were placed on a table in the sanctuary. Father Francis Cauterucci, the parish’s pastor, led the congregation in a prayer for deceased Mummers, whose names were read by Brian Donnelly of the Shooting Stars Fancy Brigade. Donnelly, one of the organizers of the liturgy, stressed that the pre-parade celebration was essential. The Mummers Mass and the parade bridge generational and cultural divides, said Edward McBride, manager of local government affairs for PECO, which sponsors the fancy brigade finale at the Philadelphia Convention Center. Situated in the heart of “Mummer’s territory,” Our Lady of Mount Carmel Parish’s annual liturgy is central to the overall Mummer tradition, said Squilla. After Mass, members of the Quaker City String Band led the final procession, performing several selections at the back of the church as parishioners clapped and showed off their best Mummers’ strut. While attendance at the Mummers Mass doesn’t guarantee a parade trophy, having Jesus walk with you down Broad Street is comforting, said Matt Kelly, a saxophonist with Quaker City String Band.